Several of these passages in our study of the book of Esther have made me reflect upon my five to six years of high-level involvement in the political realm. Though I honor those who do it as those involved in honorable service, especially those who humbly do it as serving God while serving also their fellow man (and there are such in politics), there really are a lot of troubled people in this field of endeavor. I know — no big revelation there! I met more than a couple who were “Haman types” relative to our story in Esther — people who reveled in and found their personal meaning in life defined by where they were on the political ladder. No matter where they were or how much they had accomplished that was honorable, they were never satisfied with their place in the pecking order. They were always politicking, always positioning themselves for the next campaign and the next higher office. It is sort of like the story of John D. Rockefeller being asked when enough money was truly enough, and he said, “Just one more dollar.” Likewise, gaining value from high position never really quite fully satisfies. 5:9 Haman went out that day happy and in high spirits. But when he saw Mordecai at the king’s gate and observed that he neither rose nor showed fear in his presence, he was filled with rage against Mordecai. 10 Nevertheless, Haman restrained himself and went home. Yes, yes, it’s true. There is nothing more honoring than to have a pile of sons. True greatness! The Greek historian Herodotus wrote of the Persians that “Next to prowess in arms, it is the greatest proof of manly excellence to be the father of many sons. Every year the king sends rich gifts to the man who can show the largest number: for they hold that number is strength.” (At least the Persians had something right!) Haman had 10 sons (9:7-10). Really, if you have to call together your friends and wife to have an audience to hear your recitation about how great you are, you’ve got a few issues. Haman was happy, happy, happy … except for one thing — “that Jew, Mordecai.” And as evidence that his wife and friends were of no better character, they suggest he build a gallows that would be 75 feet high and hang Mordecai upon the king’s authority. Other translations have that it was a pole to impale a person upon as a means of execution. In any event, dead is dead; and the idea of having it high was for everyone to see and be fearful of the power that accomplished such a deed (like Roman crosses on a hill). It is the general opinion that people of fame and acclaim have the good life. And though there are many elements that involve glamor and alleged good times, there is no shortage of stories as to how this never truly satisfies … stories of loneliness, substance abuse, depression and even suicide by those who would seem to have it all in terms of the world’s scorecard. It is, as they say, lonely at the top. We see it throughout this story. For example, who could King Xerxes really trust? One of the great lines of all time is this: that some folks spend their whole life climbing the ladder of success, only to get to the top and discover that it was leaning against the wrong structure. There is no lasting success or satisfaction of the soul that can be found apart from the peace and settled confidence of a relationship with God through Jesus Christ. All else is a vain search that will come up empty. We just need to daily remind ourselves of this truth. In yesterday’s Scripture section from Esther 4, Esther spoke of the dangers of coming before the King unannounced and uninvited. You would either be accepted, or it was off with your head. She said, All the king’s officials and the people of the royal provinces know that for any man or woman who approaches the king in the inner court without being summoned the king has but one law: that they be put to death unless the king extends the gold scepter to them and spares their lives. Abraham Lincoln may have at times wished for such a system, though he had to play the political card game in a way that Xerxes had no need. 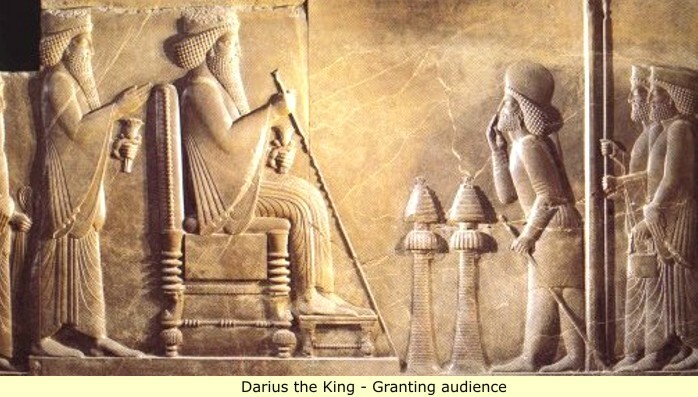 The picture with today’s devotional shows an ancient stone sculpture of King Darius of Persia (from just before the era of Xerxes) and you can see the scepter in his hand. But Esther puts aside the fear and concern and comes before the king to ultimately apprise him of the situation. And as you see, she is going to do it in a multi-step process. 5:1 – On the third day Esther put on her royal robes and stood in the inner court of the palace, in front of the king’s hall. The king was sitting on his royal throne in the hall, facing the entrance. 2 When he saw Queen Esther standing in the court, he was pleased with her and held out to her the gold scepter that was in his hand. So Esther approached and touched the tip of the scepter. I believe it is a rather common experience of believers today to undervalue the nature of the relationship that they have with God. So many see God as very much like an ancient king on his throne … don’t get near him unless you are asked, because he is very random. And frankly, he is quite cranky, you don’t know what you’re going to get from him. So it is better to just stay away and not bother him. You might add, “But God is a God of judgment” … the Scriptures say it is a terrible thing to fall into the hands of an angry God … that He cannot stand anyone in his presence who is not perfectly pure and righteous. But you see, we don’t stand there simply in our own filth, but rather in the righteousness of Christ and with Christ there as the guarantee of having had our sins paid for by him. We can come before the throne in confidence, and we’ll tell you why over the next two days.